American Motorcycles Norway / Veteran-Mc.com: The story of Bjarne Wist a motorcyclist and his Harley factory racer. The story of Bjarne Wist a motorcyclist and his Harley factory racer. Bjarne Wist (1894-1989) grew up with 10 siblings on the family farm from which he got his surname, Wist in Sparbu outside the town of Steinkjer. The farm was located along the road that today is the main road from north to south of Norway, E6 and from an early age he was inspired by cars and motorcycles passing by the farm. If he spotted a vehicle he would run down next to the road to get a glimpse. From schoolboy years he grew a huge fascination for the thrill of speed. 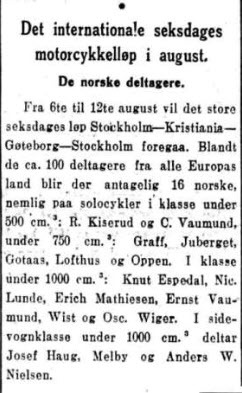 As a young man Bjarne in 1920 had the opportunity to ride from Trondheim to Christiania (the former name of Oslo, capitol of Norway) as passenger in a car owned by a relative that had emigrated to the US. 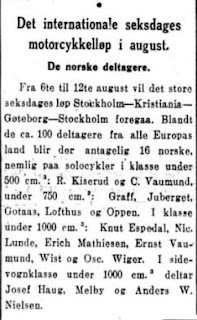 This relative,Ole Røstø vacating in his old country had become a pioneer of early aviation in USA. He had been air born in a self constructed plane as early as 1909. Ole (aka Olivier) Rosto driving his Packard with young Bjarne as one of his passengers, picture is taken while they crossed the Hemnekjølen mountains. This car ride must have inspired young Wist, as not long after he in partnership with two childhood friends O. I. Iversen and Petrus Aalberg bought the wreck of a military seaplane that had crashed near the city of Trondheim. Iversen had a small workshop in Steinkjær where the three comrades restored aircraft. When the plane was all done, they agred that they would only tax the plane on the fjord since none of them had ever flown nor had any experience with flying. They soon discovered that they had gotten the airplane's center of gravity slightly out of balance. Poor Aalberg had to sit on the tail when the plane was taxing on the fjord for the first time, Bjarne Wist in control of throtle and Iverson in control of the helm. Things did not go as planned and as the plane picked up speed it suddenly took off in a stall and the entire plane landed upside down. Luckily all three survived though it took time before Iversen came loose from cockpit. There was lots of audience at shore and in boats on the fjord to see the daredevils, and they were soon rescued by a boat arriving the scene. This single event set a stop to the young men's career in aviation. Wist now turned his eyes on motorcycling to get thrills and speed. 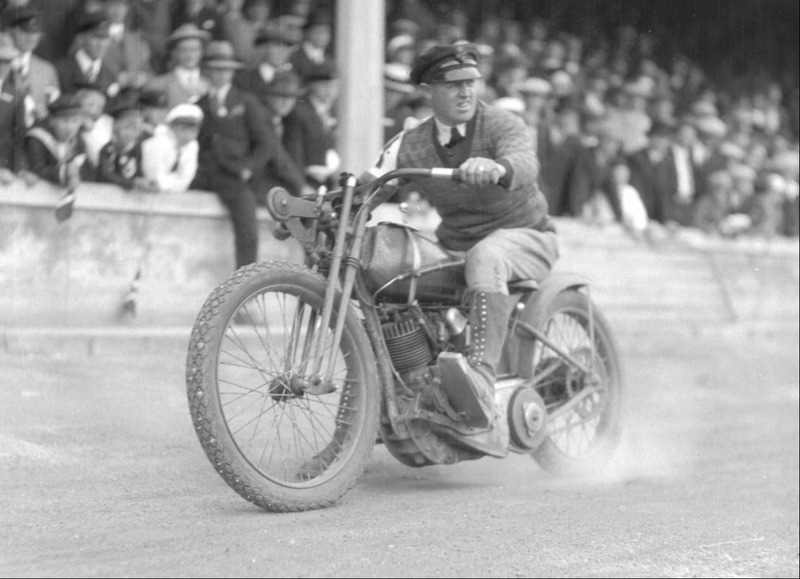 He soon bought a motorcycle and started competing in different sports and he soon did very well, primarily in racing oval horse tracks, the precursor of speedway. In Norwegian this was called “rundbane”. His nearest race track was located at Trondheim stadium Øya, in the middle of town. This track was inspired by the more professional tracks on the continent as they had made the curves of the track angled upwards by stacking mud and gravel. Bjarne made himself an unbeatable driving technique in order to minimize lap times. He was careful in not getting too far out trough the curves and thus saving much time. Drivers visiting from the clubs in Oslo did not master this technique and Bjarne was considered unbeatable at his hometowns number one race track. 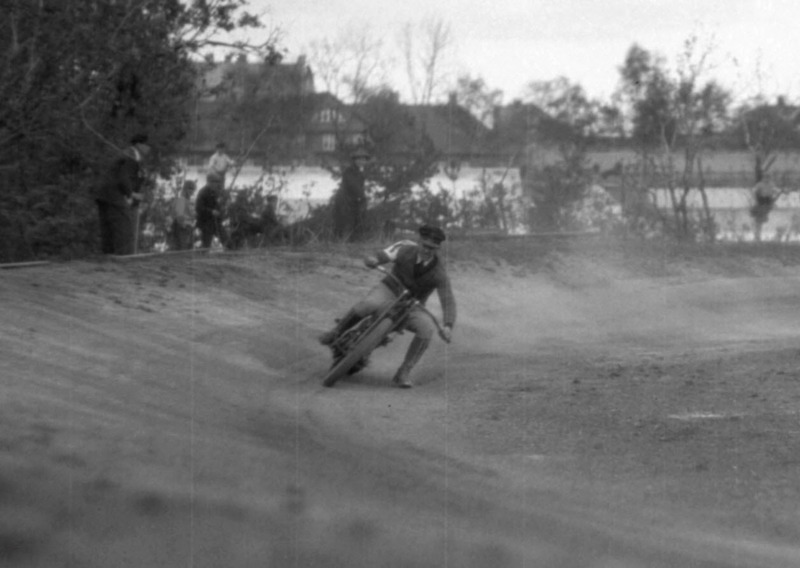 Bjarne was one of the first Norwegians riding with steel shoe at his left foot, to be able to slide trough the curves. Skipping the footboards got him plenty of extra lean trough the curves. He did also drive with steel studs in both front and rear tires. His style of riding was pretty much as in modern time speedway and must have impressed his challengers. This picture show Bjarne Wist using his skills getting trough the curve of Trondheim stadium. Bjarne once told in an interview he had broken both arms and legs but never in competition, just during practise. Times for sure where different from today when Bjarne practiced his skills, racing his motorbike at the local tarmac. None complained in the roaring noise even if afternoon or night and in the middle of town with loads of surrounding neighborhoods! 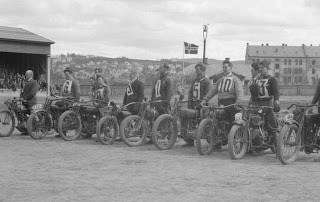 Oval track racing was a popular sport in Trondheim during the twenties and thirties. In those years a race could draw a crowd of thousands of people as audience. It was 7-8 active drivers in Trondheim at the time when Bjarne was racing. Most used standard machines that were rebuilt as needed. The guys mixed their own alcohol-based fuel mixtures and experimented with their engines to achieve maximum efficiency. This was not always as successful as intended the motors reliability would suffer. Bjarne started his career as a motorcycle racer with Indians, first off a modified 500 cc Indian Scout, later an Indian Chief. 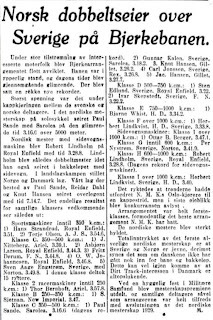 The below news paper clippings show results from a race held in Trondheim, one that took place at the Korketrekkeren, a famous race held in Oslo and finally one clip showing that Bjarne did compete in the 6 days ISDT rally held in Scandinavia where the riders drove both in Sweden and in Norway. This ISDT rally was the fourth ever held. All three clips are from news papers dated to 1923. 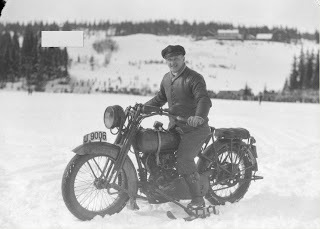 Later Bjarne would favorite Harley Davidson and his Harley racer was obtained trough Sørensen and Balchen in Oslo who at the time was the Harley import to Norway. They supplied Norwegians with their Harleys into the late forties. Bjarnes Harley racer must have been purchased in 1926-27 by studying the details in images available of the bike. This Harley racer was a very fast machine but Bjarne described its engine as somewhat "tender" or “fragile”. Mechanics on this racing Harley was taken care of by a local motorcycle mechanic Olav T. Ness, who ran a motorcycle repair shop in Møllenberg in Trondheim. This guy was trusted by Bjarne to be in charge of tuning and maintaining the engine as well as the bike. 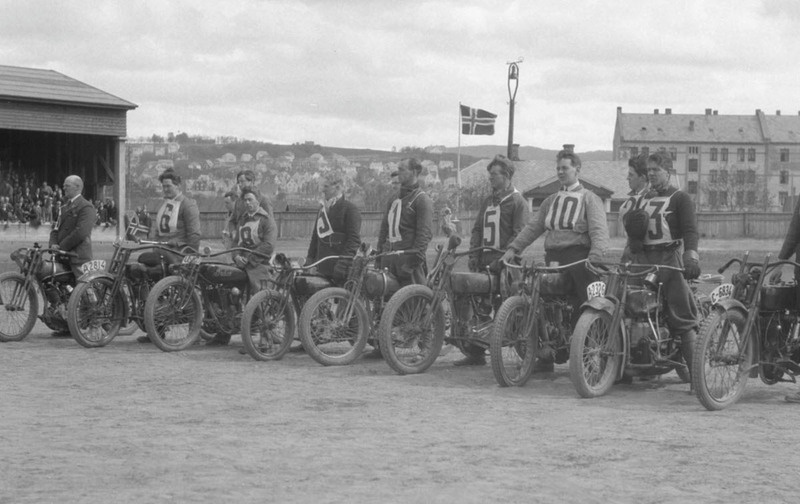 The below picture was taken just before the start of a race at Trondheim Stadium in 1928. Pay particular attention to the mascot on the middle of the bikes handlebars. This little toy is seen in other pictures of the bike too. Bjarnes Harley factory racer built for European racing was a 1000cc (61”), supplied with the original 3 speed gearbox. This was quite different from in the US where they would skip the entire gearbox. Harley additionally made a two speed gearbox intended for the UK, Australian and New-Zealand dirt track markets. The frame of the bike where of Keystone type in wich the engine acts as a part of the frame structure as well as the steel plates on each side of the engine crank cases support the engine allowing increased performance and higher revs during racing. Most for sure this bike was supplied from the factory with a twin cam motor, unfortunately the timing side of the engine is not seen in any picture found yet. A Schebler AMX racing carburetor designed for alcohol (barrel carburetor) is clearly seen in the detailed pictures. 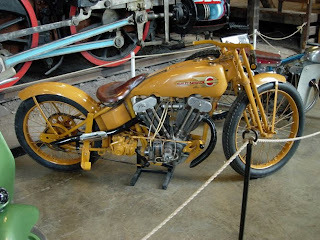 Unfortunately the motor did not survive and was replaced in the early thirties by a JAP V-twin engine. This was run on alcohol too. 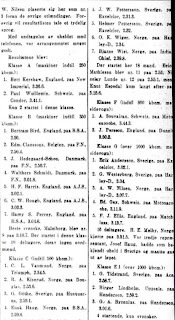 This is “Adresseavisens”, the local newspaper of Trondheim`s headline in connection with the race held at the stadium in Trondheim in 1928. 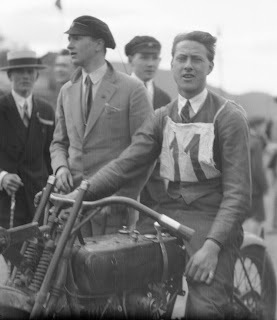 In this race, one can see that most bikes are converted standard machines whilst Helge Larsen, start number 11`s Harley is more modified to look like a real racer. Bjarne Wist`s bike is the only “real” racing machine in the event. 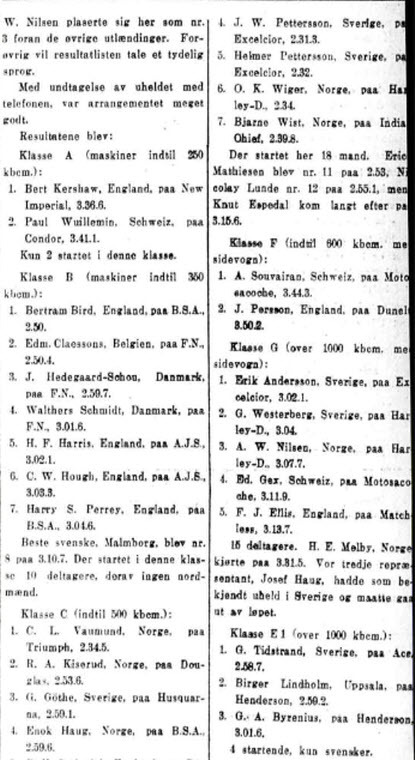 In the picture below one can study the participants at the 1928 race that took place at Trondheim stadium. At the far left is Bjarne Wist, well dressed in suit and tie, then a Harley, two Indian Scouts, a single-cylinder Harley, an elderly Indian Power Plus with a Harley by his side, a four-cylinder ACE and at the far right a view of Helge Larsen`s Harley racer. The license plate on the front mudguard of Larsens mount tell us that this hopped up Harley was used in the streets as well as on the tarmac. Bjarne Wist ready to take off. Left foot on the clutch, and full throttle. Bjarne did participate in numerous events taking place in other parts of the country too, as in Oslo. Here too, the newspaper clips tells us his he did well and ranked high. 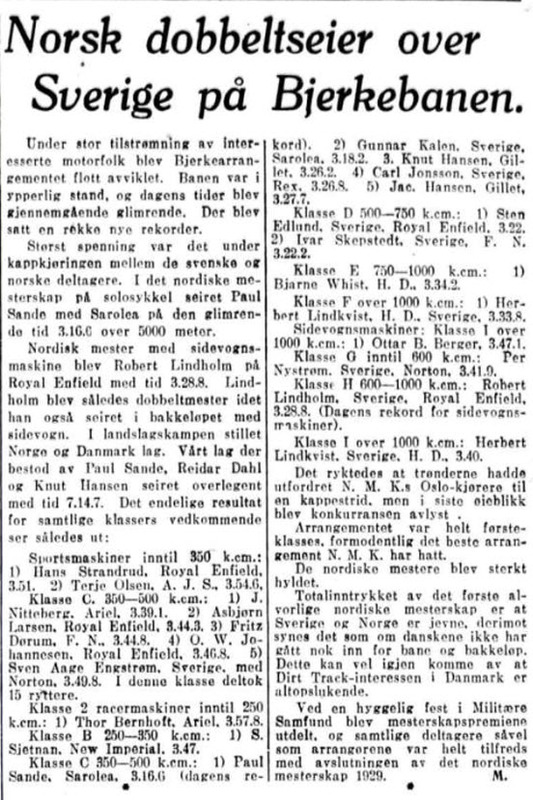 The below clip from Bjerkebanen first weekend in September 1929 show he won his class. In addition to oval racing he as mentioned earlier participated several times in the Korketrekkeren with good results as in 1923 and in 1925, now riding a Harley Davidson. Bjarne drove many regularity trials too, on open roads locally and he once in his career joined the in its time famous test of strength and reliability; the Kristiania Trondheim and return. This was a total distance of more than 1000km on gravel roads, facing snow across the mountains passes. This one time when Bjarne participated he was mounting a Henderson who by his own words was a very reliable machine for long distances with its four-cylindered engine. This was not a speed contest, participants drove on ideal time and it was not allowed to break speed limits. Bjarne found it to challenging competing in this rally as he had to go to Oslo in advance of the run and back after having completed, this giving a total of more than 2000km. In 1932 Bjarne and his wife started a gas station in Trondheim and eventually this turned into a larger shop selling cars. As the company grew it was harder to find spare time for motorcycling. His wife had to manage the business while he went off to join races. 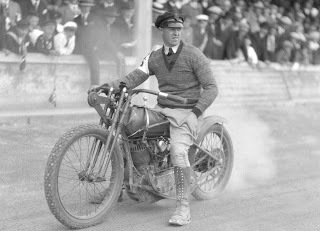 The motorcycle hobby was not at all cheap and much was sacrificed in order to continue racing. Bjarne drove the Harley brand as transportation too. This capture from when he visited a ice race at leangen in the early thirties. In the late seventies Bjarne still keeping his old Harley racer was contacted by Norwegian Technological museum as they where to display motorcycles in an upcoming exhibition. He then chose to donate his bike to the museum where it still is resting next to another speedway heros bike, Basse Hveems home built JAP racer. Bjarne Wist`s Harley racer next to Basse Hveems JAP racer at NTM. When NRK (Norwegian broadcasting) interviewed Bjarne Wist in 1984 at the age of 90 years, he still appreciated the thrill of speed and frequently used his red sports car. NRK's archives, Aftenposten archives Adresseavisens archives, museum archives Sverresborg, Bjarne Wist d.y. If anyone still wonder where the cutdowns and bobbers origin from, eh have a guess. Hi Harald, thanks for your kind words. I`ve not forgotten those Injun pics you provided, they will get on here eventually. Fantastisk artikkel! Lest bloggen din en stund, men første gang jeg kommenterer. Hi Dennis, thanks for comments. Checked out your "thesureshot" blog and your gereat work of graphics too. Whow I like those bicicle movies and what you guys can do with pedal power. I`m pretty sure those skils would be something to master.